One of the best ways to support Berkshire HorseWorks, Inc and its mission is to sponsor one of the nonprofit’s hard working and amazing equines –- most of whom are rescues. 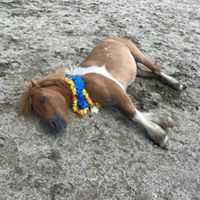 Equine Assisted Psychotherapy (EAP) and Equine Assisted Learning (EAL) are wonderfully effective tools in helping those at-risk in the community rediscover their dignity and sense of self. BUT caring for these healers comes with a significant financial burden. 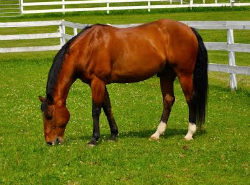 Along with providing proper stabling/shelter and staff to look after and care for them, the organization covers the costs for all feed, veterinary visits, and farrier services. Basic care for one horse annually is over $4,000 which can be challenging. If only love could cover the bills!! Sponsoring is a great way to make a meaningful contribution. ALL funds received through the “Sponsor A Horse” program will be used exclusively for the development of sound, healthy, and well cared for equines in the program. Funds will be used toward feed, bedding, vaccinations, hoof trimming, and other routine veterinary care. In exchange for your and/or your company’s generous support, BHW will recognize your efforts on multiple platforms. 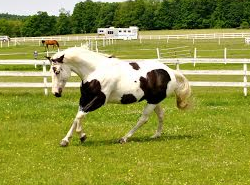 First, you will receive a Certificate of Sponsorship with a photo of your horse. Duplicate certificates will be displayed in BHW’s barn or office. You will also receive recognition in Berkshire HorseWorks newsletters, and on the website. BHW will additionally thank you and/ or your organization through the dissemination of press releases to local media, and through other collateral materials! You are welcome visit your horse during regular hours, but we do suggest that you call ahead to determine when your horse is not “on the job”. You are always welcome to come down and groom, walk, and assist BHW staff with his/her daily care as long as you ask for assistance. If you would like additional information, contact Hayley by phone or email. Berkshire HorseWorks, Inc is a recognized nonprofit organization under section 501(c)3 of the Internal Revenue Code. Your contribution is tax deductible to the fullest extent allowed by law. 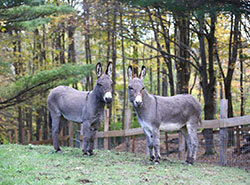 These sweet Sicilian mini donkeys are relatively new to the herd. They play a big role in multiple programs ranging from Girls Rule! an empowerment initiative for young women to “SSSP” where those with special needs cultivate life skills . They love to be snuggled by just about anyone and provide the emotional reinforcement that many who come to the ranch are seeking. They think that apples and carrots are the best things on the planet and that walk to the mailbox are exotic excursions! 007 AKA Dubs is a sweet laid-back pony. In his previous home he to enjoyed being part of the mounted lesson program. Dubs seems unassuming and quiet but can give any of the big boys in the herd a run for their money if the gate is open! He loves being brushed, walked, and basically being the center of attention. In exchange for his pampering he will give you the sweetest hugs and make you smile. Dubs loves treats of all kinds, including bananas! He is currently learning what trails are and to be a trail lesson horse. He is an integral part of all EAGALA “EAP” and “EAL” programs as well as Equine Assisted Team building sessions for the school districts. Zephyr AKA Zeph is a shy guy. 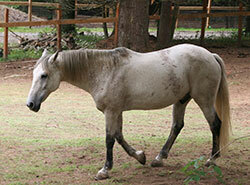 His long gray mane, imposing stature and gentle eyes earn him a place in everyone’s heart. He is a big love bug. Zeph cannot be ridden due to arthritis throughout his entire spine but, he loves to free lunge, be groomed, and walk on a lead with you as you meditate and breathe in unison. During sessions everyone wants to work with Zeph. There is just something about this mysterious gelding that draws everyone in! Come meet him for yourself and see what he is about! Pumpkin is our feisty little pony. A shetland mini cross with a long orange mane ,he will test your boundaries to make sure that they are in place. He can be a handful at times but that has proven to be such an asset to all of BHW’s programs as it helps people face their challenges, and work together to problem solve . Pumpkin is the “Chihuahua” of horses, a little man with a big personality. He is loveable, yet sassy, and that is what attracts many clients to work with him. Pumpkin has a sweet side too! He isn’t the biggest fan of standing around to be brushed but he is working on his patience as he does want to please. Spirit is a soulful rescue horse from Montana who doesn’t trust easily. He was worked too hard when he was young and suffered emotional and physical scars. He provides our clients with a bit more of a challenge, although a favorite with most of the at- risk children. He is a real looker with his two beautiful blue eyes and painted body and when connection is established no one can break the bond. A trusted partner on the trails, Spirit is sensitive to the emotions and intentions of those around him and will protect to the end those who are courageous enough to face their emotions.